On Wednesday, the Dow tanked 832 points. It represents the 3rd largest one-day point collapse of the Dow in history, and it doesn’t seem like we’re finished yet. On Thursday, the Dow toppled further, closing down another 545 points. And now it’s October. The weakening market could show its colors starting this Fall, crash hard, and have ripple effects lasting into next year. In October 1929, the Great Depression started. In 1987, “Black Monday” was on October 19, with ripple effects lasting long into 1988. On September 29, 2008 the Dow lost 777 points, and massive market panic ensued that cost many people their retirement. A Great Recession followed. So if history is repeating itself, brace yourself. The signals may have been pointing at this very moment for the next big market correction. There are many reasons to point to for why this may be happening now: similar “scripts” the Fed didn’t learn from in 2008, trade wars, rising rates set by a hawkish fed, and lots of U.S. debt. It’s all happening right now, and it’s putting incredible stress on the market. Market strategist Ryan Nauman focused overseas when he told Reuters, “it is a perfect storm for technology right now with the tariff war with China and weaker demand for chips,” zeroing in on trade impacts there. … the market has been vulnerable due to high valuations, and now the interest rate rise adds pressure as investors look at alternatives in the higher yielding bond market. Big companies are feeling the impact too. FANG stocks (Facebook, Amazon, Netflix, and Google) are taking a beating according to another MarketWatch report, with Amazon dropping 6.2% Wednesday, and Netflix stock dropping 8.2%. With the signals pointing to a market collapse present and accounted for, the only thing left is the main event. If it isn’t happening right now, it sure seems imminent. The latest rate hike was approved on September 26, with several more already priced in. With a move like this, it seems like Chairman Powell may have tunnel vision. 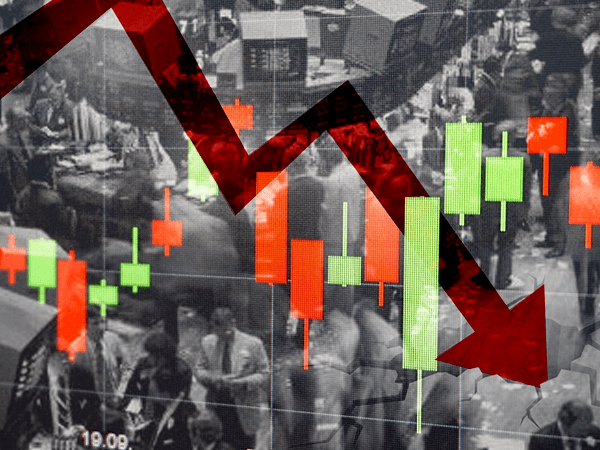 We see a large panic event taking shape now that continues into next year — the melt-up we forecasted is done… Investors should be out of stocks for most of 2019. That sure looks like an uncertain market. Even if the Dow recovers from this big hit, what about next week? Banks have run out of their safety net options they had in 2008. Quantitative Easing pulled us out of the depths of the Great Recession, but that process is running in reverse and is only just beginning to “claw back” the billions in cheap money that flooded the market. What can the Fed do now if the market collapses? Not much. We’re on a roller coaster ride, and we just tipped over the highest point. It’s about to get bumpy, so make sure you’re secure. Investing in assets known for their security during times of uncertainty like gold and silver can help provide you with stability.